WHY DO I PAINT JESUS THIS WAY? These scriptures describing David are the basis on which some artists present Jesus with reddish colored hair - it was popular to do this in the past. 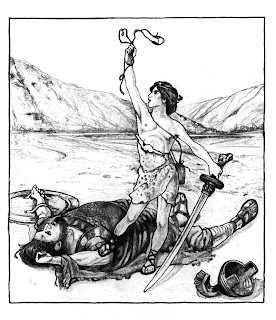 The Hebrew word used to describe David as “ruddy” is the same Hebrew word used to describe Esau as red. This is the Hebrew word Admoni – pronounce Ad-Mo_nee. The scripture does not specify whether it is David’s hair or skin that is “ruddy” (but in the case of Esau I think that it is hair). Artists sometimes apply this to hair and make the hair of Jesus “ruddy”. This is meant to point to the belief that Jesus came from the bloodline of David – as required by the scriptures. Further, Jesus being depicted with beautiful eyes is based upon these scriptures for the same reason. These are artistic expressions of scripture. An artist defines beauty according to culture. Many European cultures consider blue eyes to be the most beautiful. So, when artists from these cultures portray Jesus with blue eyes it is an attempt to present beauty – and not a racial statement. 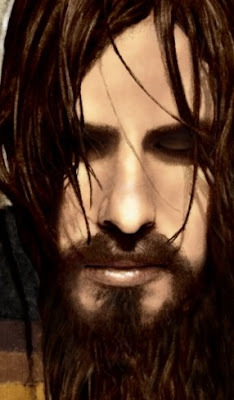 In my first picture, I present Jesus with hair that is highlighted “ruddy” and green eyes. Green is the most rare eye color in the world, yet the trait is present in populations related to the subject (consider the world famous photo of the Afghan girl with the haunting green eyes). 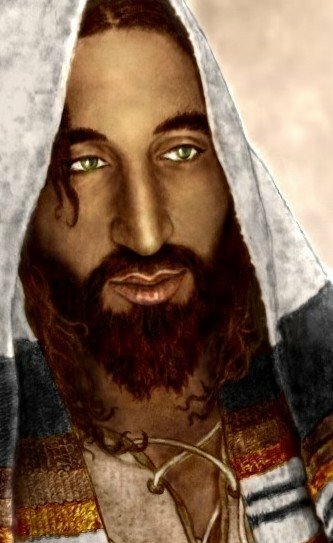 In my second picture I present Jesus with light brown eyes. By merely darkening the complexion, Jesus looks more Middle Eastern. Many artists may shy away from such a portrayal due to personal/cultural preferences – they do not want to give Jesus the face of a suicide bomber. Further, the accuracy of portraying Him that way is questionable, though conceivable. 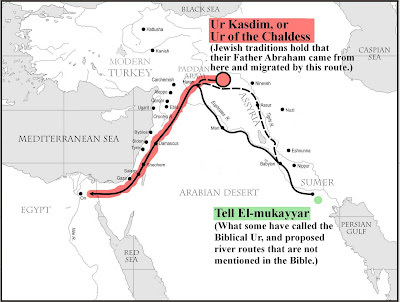 Many authorities (as well as Jewish tradition, as well as Islamic tradition) hold that Abraham indeed was from Northern Mesopotamia - Ur Kaśdim or Ur of the Chaldees. The location is in South Eastern Turkey and in proximity to the Kurdish people. Nearby are the Armenians. From this area Abraham migrated down to the land we now call Israel. You can do a Google image search for "Kurds" and "Armenians" to get a good idea of how Jesus may have looked if the bloodline remained pure. It seems to me that the Kurdish people have remained more isolated than the Armenians. So maybe the Kurds are more representative of what Father Abraham looked like, and the way the pure-blooded Israelite looked. Understand that the idea is not that Israelites (including Jesus) were Kurds and/or Armenians - it is that they all came from the same stock of people. It is in the DNA! 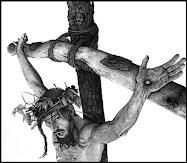 WAS THE BLOODLINE OF JESUS PURE? I think that it was pure. There are two genealogies of Jesus in the Bible. The line of Jesus is traced through Mary in the Gospel of Luke. And His line is traced through Joseph in the Gospel of Matthew. The line of Joseph indicated mixing with gentiles (though some scholars disagree). Further, this line was discredited from being a kingly line. Messianic Jews today consider the genealogy of Joseph to be evidence that Jesus was virgin born - for the blood of that line was NOT in Jesus. It appears that the line of Mary was pure. Some say that Bathsheba was a gentile – because her husband was a Hittite (from an empire that was north of Judea). But I doubt this claim. The scriptures specify that the husband was Hittite, but never Bathsheba. I think that the only way the Hittite was able to have rank in the service of King David was to be a convert to the faith and marry the Jewess, Bathsheba. Further, there was much emphasis in avoiding intermarriage during the times that preceded Jesus. Christians understand that Jesus was not extraordinary in His appearance. Yet, when we depict Him we do so reverently. This usually results in a handsome depiction of Jesus. But there is NOT a reason to conclude that He was ugly. Jesus looked like a regular Jewish man living in Israel about 2000 years ago. DID JESUS WEAR HIS HAIR LONG OR SHORT? This is another thing that people choose to disagree on. Nobody knows the answer to this. The opinion of what is long hair or short hair for a man changes a little according to the times and culture. What was the trend for Jewish men 2000 years ago? Jesus likely followed that convention. Many use the words of Paul to justify the claim that Jesus had short hair. But you must consider the context of the scripture. Read the scriptures before and after this, and consider whom he is talking to and why. The issue he is addressing is NOT the length a man keeps his hair. To those that advocate that Jesus had short hair, I bring up the issue of "side locks". Jewish men did not cut the hair on the sides of their heads (see Leviticus 19:27-28 for the reason). They let this hair grow long. There are varying traditions on how to wear these side locks. Some wear them in front of the ears. Others pull the locks behind the ears. Some grow the side locks to the jaw line. Others grow the hair locks longer. Some never cut them. 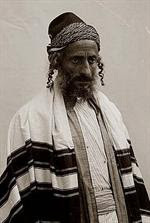 Of particular interest is that the Yemenite Jews grow their side locks to the upper arm and say that they have maintained this tradition from the time of the Second Temple (that is the time of Jesus). The question should be, did Jesus wear the length of his hair to match the length of his side locks, or not? Even if Jesus cut his hair short, he had longer side locks – and his hair would look long with the side locks hanging out of the traditional Jewish headdress. Either way, Jesus did not have a Roman or traditional modern hairstyle. DID JESUS HAVE A BEARD? YES! This verse is why we portray Jesus with a beard. Those that do NOT do this deny that this passage is a messianic prophecy that makes reference to Christ. I have seen that some Christians suggest that Jesus was groomed like the Romans (short hair and clean-shaven). It is odd to me to expect that the Jewish men would copy their enemies. But there are people that point to early depictions of Jesus with short hair and a shaved face. These Murals of Jesus were by early Christians in the area of Rome. We must recognize that these Roman Christians/artists made Jesus look like them. We should be just as critical of Roman depictions of Jesus as we are about the European depictions from the Middle Ages that make Him look... European. In my opinion, the European artists of the Middle ages did an overall better job presenting Christ than that Roman version. Often the European artists gave Christ the elongated features we expect to see in someone of Jewish decent. IS THERE A PORTRAIT OR DESCRIPTION OF JESUS? NO. It was against Jewish custom to have an image of a person. This was in order to obey one of the 10 commandments - the one about not having any "graven images". So, we have no portrait or depiction of Jesus from those that actually saw Him. There is a claim that the Jewish historian Josephus wrote a description of Jesus. It is a ridiculous description. People that quote this description usually include the reference, as if that makes it true. I researched this and found that it is bogus. Josephus did NOT write a description of Jesus. When I depict the Messiah I follow certain traditions, understanding that there is a basis for those. We have an iconic image that is recognizable all over the world. I think it is OK to adjust the complexion of the subject, depending on the culture. But if we stray too far from the familiar we create the need to explain the depiction of Christ – which is a distraction from the message. The message is that we are a broken humanity and need the hand of God to keep us from ultimately destroying ourselves. When I say destroy ourselves I am talking about humanity as a whole. Sometimes individuals will self-destruct, but often wicked people prosper and die happy. But humanity as a whole is racing toward self-destruction! We chose the knowledge of good and evil. And so, we must…know evil. We must see it and do it. To experience pain and death is to know evil. We can then compare evil with what is good, thereby having knowledge of both. Do we have to totally destroy the world to have full knowledge of evil? We need the right hand of God to save us – that was and is the Messiah. I did not accept Him because I was a drug addict, or a homosexual burned out from the “lifestyle”, or a sexually abused child, or a man in a broken marriage, or a patient suffering from a life-threatening illness, or someone in financial crisis. Sometimes, I grow weary of hearing all the messages about how Jesus will heal your broken heart and make you prosper. Indeed, Jesus does that. But it is not just those of ill circumstances that are in need of the Savior. Jesus is not a “crutch” for the weak-minded to get through life. People that say this do not understand that it may be easier to go through life on your own selfish terms than to submit to the ways of God. The religions of this world are about forms and rituals that are efforts by humanity to reach the divine. Obviously, humanity has not had success – just look around. But Jesus… this is about God reaching down to humanity to ultimately save us from evil.